On September 11, 2009 the new building for the ITA – Institut für Textilforschung (institute for textile research) in Aachen was inaugurated. On the occasion of the inauguration ceremony the 75th anniversary of the institute was celebrated at the same time. Thanks to the nice weather, the ceremony could take place out in the open – thus in direct view of the new textile concrete that has been developed there up to being ready for the market now. It is quite ideal when the location where a new material has been developed is also built of the same. The hall façade of the new institute building is completely made of textile concrete. Moreover, the building is the first one constructed in this manner worldwide. Therefore, the director of the institute, Prof. Thomas Gries, is equally proud to whom at last the key was formally presented by the head of the branch o_ce of “Bau- und Liegenschaftsbetrieb NRW” in Aachen, Harald K. Lange. Even as important as the institute is for textile research, as large was the key: It actually provided place for seven speakers and the director of the institute for an official photo. Their speeches held before the key was handed over had been remarkably entertaining and were introduced by the academic director of ITA, Dr. Thomas Veith. As expected, not only the rector of RWTH Aachen and officials of the textile industry got the opportunity to speak but also responsible politicians: hence appreciatory remarks were made by former Parliamentary State Secretary of the Federal Ministry of Education and Research, Dr. Thomas Rachel, the Head of Department of Economics in North- Rhine Westphalia, Karl- Uwe Bütov as well as by Dr. Walther Pelzer of the Ministry of Sciences in North- Rhine Westphalia. In his speech Rachel in particular addressed the efficiency of textile concrete in respect of climate protection. He thus pointed out that it was possible to avoid 420 tons of Carbondioxid emission when constructing the building „Innotex“ as the building of the institute is called. Furthermore, he saw the entire mankind on the threshold to a new material era. He never got exhausted to emphasize that ITA was a qualified recipient of subsidies from the 400 million euro high-tech budget granted by the Ministry of Research. Rector Schmachtenberg referred in his solemn speech to the central importance of the institute for the university. As ITA is one of two parts of the cluster that decided about the status of excellence the RWTH Aachen was granted. As a result, the university anyhow ranks first now in the German-wide university ranking of the DFG – Deutsche Forschungs Gemeinschaft (German Research Foundation). Furthermore, the greetings of the responsible architect of the project, Alexander Koch of Carpus + Partner, are worth mentioning. For him it was important to emphasize how complex it was having to cope with the completely new building material textile concrete. Because the planner must not lose sight of the classical standards. In this respect, he stated the examples of highest flexibility in terms of utilization, providing numerous and reasonable visual orientations and the fact that everything is in short distance. These will be the components that ensure a high feelgood factor in the long run. However, textile concrete just accounts for approx. 10 % of research and day-to-day work of the ITA. The tasks of the institute are mainly concentrating on development and research of new textiles, added by new weaving techniques (keyword: 3D weaving) as well as mechanical engineering, meaning finally the design of even more e_cient weaving machines. In this regard, automotive engineering is a very important factor for the textile industry. High-tech textiles here are not only used for seat covers and car interior lining but above all also for seat belts and air bags. Externally, the institute building is divided into two parts. The higher, a little bit older part is the eye-catching one: the approx. 20 m high spinning tower. Spinning machines are developed and tested here. 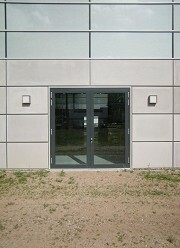 The actual new building is connected to the north side of the same: a hall of some 20 m width and about 50 m depth being oriented in east-west direction. In its eastern third an administration unit of two stories is integrated, including two charming and lushly planted courtyards on the second floor. In the large, western part of the hall above all robot controlled weaving and braiding machines are installed, which are either used to develop new kinds of textiles or to test them, or they are just under scrutiny themselves. Textile concrete here is only available as a specimen or outside at the façade, because it was finally manufactured by Durapact GmbH in Düsseldorf, a company in the field of fiber concrete technology. For textile concrete a biaxial fabric is used for reinforcing purposes instead of the ordinary constructional steel. The application of fibers reduces the volume by up to 84% maintaining the same load-bearing capacity. The reasons for this fact are the left out steel as well as the obvious reduction in concrete cover, which otherwise is mainly required for corrosion protection. For manufacturing of textile concrete self-compacting concrete (SCC) is primarily applied. The reason for this fact is that vibration of the anyway quite thin material might lead to a statically relevant dislocation of the textile reinforcement and/or even to floating of the same. In addition, at the phase to the fabric undesirable concrete pockets may build up. All these requirements led to the decision to segment the façade into transportable components and to manufacture them in the factory. All precast concrete components having a size of 3.00 m x 1.00 m with a thickness of 20 cm were finally manufactured in the Düsseldorf based factory. In this process, almost half of the cladding accounted for the core being a rigid foam insulation. Here, another advantage of the new building material is revealed: Though the actual fiber reinforced concrete does not insulate even better than the conventional version. But as this concrete has to be dimensioned only according to the static requirements, the thus gained volume can be used for insulation purposed. The single components were then individually installed and the joints were closed in a permanently elastic way. With the knowledge about the technical details, one tends to agree with Mr. Rachel that the material textile concrete actually has the potential to revolutionize the construction sector in the long run. It may only take same time, until the first building will be constructed with a supporting structure made of textile concrete and not exclusively the façade which is not relevant concerning statics – as for example in case of the ITA.